You don't have to wait. You can write ES2018 now and Babel will transform it into syntax that today's browsers understand. Note: If you use Babel, the only syntax checker you should choose is ESLint. It's the only one that understands ES2015 syntax. By default, Babel will automatically configure itself to support the browsers you specify in Target Browsers. 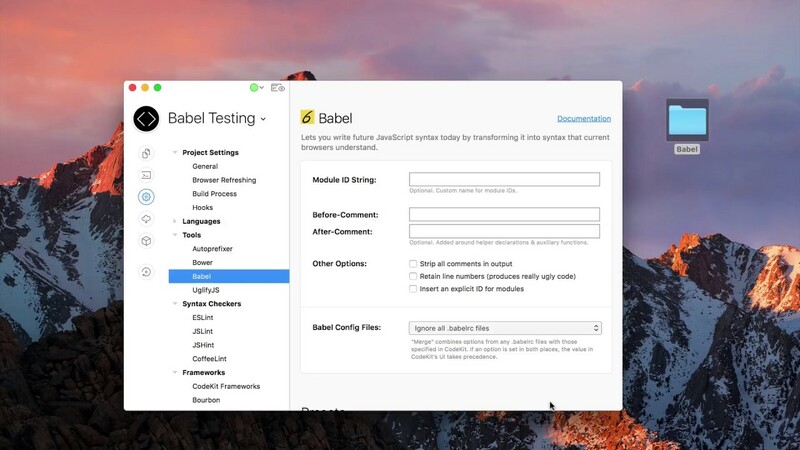 If needed, you can manually configure Babel by changing the "Babel Configuration" option and then enabling specific Babel plugins from the list. The before/after comments will wrap Babel-generated code so you can see what the transpiler produces. For details about the remaining options shown above, see the Babel documentation. You can also tell CodeKit to use only your .babelrc files. To do that, select the appropriate option in the "Babel Configuration" pop-up button. If your project uses React or Flow, just check the appropriate box to enable support for each. You must install these plugins using npm, since they don't ship with CodeKit. They should be in a node_modules directory under your Project's Root Folder. Verify that each one is compatible with the version of Babel in CodeKit (see the About Window). You may want to use a .babelrc file if your third-party plugins require custom options. The plugins are grouped by their official category. Check the box to enable a plugin or leave it unchecked to disable it. Note:If Babel is set to "auto-configure", any plugins that you select are passed in addition to the plugins that Babel automatically enables to support your target browsers.